Ideal for clean up, wet or dry carry, storage. Durable, recyclable, weather resistant. Resists rodents and won't absorb odors. This DuraFlex plastic pail is molded from a tough polyethylene resin that is impact-resistant, protects against warpage and helps prevent stress cracks. 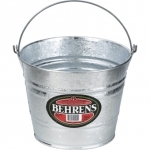 All pails feature heavy-duty eyelets and handles. 8 quart duraflex plastic bucket. DURAFLEX 8QT RUBBER ALL PURPOSE PAIL. Molded from the finest corded rubber on the market, nothing matches the pliability and strength of DuraFlex Rubber. They are crush-proof, crack-proof and freeze-proof so you can leave them outside year-round! Buckets feature heavy-duty steel handles and eyelets.